From my couch in the lounge, I can see a looming mountain of dishes on the counter next to the sink just waiting to be washed. I was reading a post on one pot cooking this morning, and made a comment on the benefits to cleaning-up this allowed for. Which got me to thinking about dishes. In my past, as a chef-in-training, the nights I got stuck washing the post-dinner-rush restaurant pots/pans/cooking utensils used to drive me nuts. That was until one evening when I realised that after the insanity of the dinner frenzy, washing the dishes was actually quite zen. My mind could wander and I could think about the events of the evening, or my plans for the next day. And slowly (very, very slowly), I began to get something out of the experience...not enjoyment (I wouldn't go as far as that), but definitely a mindfulness for the task at hand. 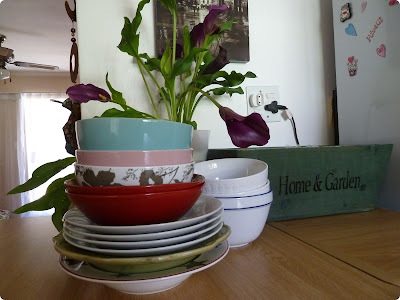 Not owning a dishwasher at home, I would sometimes grumble at having to do the dishes in addition to having cooked the meal, until I realised that my grumbling destroyed the spirit of the event...a meal shared and enjoyed with people I love. So I changed my attitude to see the dishes as a way to pay homage to the blessings of: having the funds to buy food and share it, the good times and laughter, the warmth infused into our home. I believe I have my Mom to thank for this perspective on life. As a teenager, when I walked into the kitchen and saw a ton of dishes on every surface after a day of meals for people, I would always sigh loudly, and she would always remind me: "They tell a good story!" Cleaning Up: My Postprandial Grace. It's a very special piece of writing. Have a great Friday and a brilliant weekend everyone. Thanks, Juanita. Life's beauty is most often in the small, the seemingly insignificant things, yes? In the being here, and being now? Love your piece. Glad to be part of the inspiration-begets-inspiration cycle! I know what you mean. I also used to think doing the dishes was a chore, but now I've changed my mind. I feel a bit proud about taking care of the household more than everyone else. Your mom said a very wise thing... The dishes tell a good story and they need to be clean to tell more good stories in the future too.